At Russian For Fish*, we have been rethinking space since 2006. Established by third-generation architect Pereen d’Avoine, initially as a means of entering a competition** (which the practice won), we have gone on to become one of the most successful small architectural studios working in London and the southeast. 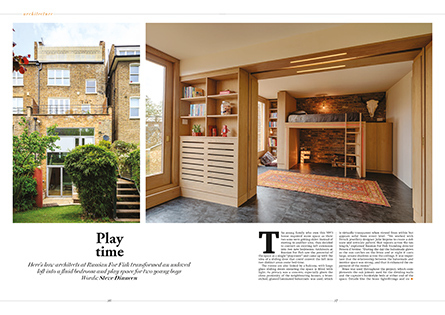 Now led by Pereen and co-director Nilesh Shah, Russian For Fish has acquired a reputation for delivering elegant, playful and innovative new-builds, extensions and renovations for residential and commercial clients at every scale. Known for simplified and sustainable material palettes and sympathetic integration with surroundings, our work is frequently shortlisted for awards and widely featured in the architecture and design press – earning us a particular reputation for realising bold and imaginative visions in compact spaces. Although we pride ourselves on our creativity and ideas, relationships are at the heart of what we do. We work with a tried and trusted network of consultants and contractors, who we know can deliver on time and to budget; and we make a point of getting to know every client, working with them collaboratively to ensure the result meets – and, often, exceeds – the demands of the brief. 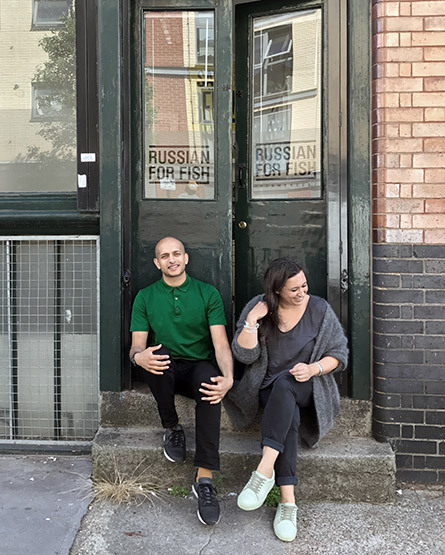 Russian For Fish is a RIBA-chartered practice and a RIBA student mentor in architecture for the University of East London’s undergraduate course, as well as a practice mentor for the Royal College of Art’s School of Architecture. * The Russian word for Fish is ‘pыба’ or ‘RIBA’, which happens to be the acronym for the Royal Institute of British Architects. ** The competition was part of the London Biennale 2006; Southwark Council requested proposals for some former public toilets in Bermondsey. Russian For Fish won with a design for an underground hammam. We’re oddly proud that our studio began life in the toilet. A graduate of the UCL’s Bartlett School of Architecture, Pereen worked with practices in London and Mumbai before founding Russian For Fish in 2006. The daughter of two generations of architects, she grew up immersed in the discipline, and often collaborates on research and speculative projects with her father Pierre d’ Avoine, with whom she tutors a diploma unit at the Cass. In the past, she has been a visiting critic at the University of Greenwich, the Bartlett and the University of Cambridge; taught architecture at Oxford Brookes, Kingston University and London Metropolitan University and lectured on interior design at the University of Kent. Her academic and research interests include adaptation and the role of materiality within the built environment. Since graduating in architecture from Edinburgh College of Art and completing his master’s at the University of Edinburgh, Nilesh worked with several practices in London (including Russian For Fish – twice) before joining Pereen as co-director in 2015. A natural problem-solver with a flair for turning pipe dreams into practical realities, Nilesh has wide-ranging experience of projects of all sizes, ranging from bespoke furniture design to complex large-scale restorations and redevelopments – including schools, hospitals and other public buildings. His interests include urban regeneration and contemporary public architecture. After earning his BA at Oxford Brookes University in 2012, Laurence went on to complete his master’s at the University of Westminster and is currently progressing towards his Part III. Alongside his ongoing projects with Russian for Fish, his architectural career to date has seen him completing residential projects in Guernsey (where he is from), working on high-end retail and hospitality environments in London, and administering affordable social housing developments on behalf of Croydon Council. With the Architecture Social Club construction team, Laurence contributed to RIBA’s 2016 Regent Street window project and to the Pink Floyd Pig installation at Liberty in 2017. When he’s not working on buildings, you’ll find him painting, engaged in graphic design and illustration projects, or at Central Saint Martins, where he is collaborating with contemporary dancers and choreographers to explore space, light and time. After receiving his BA from the National University of Singapore, Shen made his way to London, and completed his Part II at the Architectural Association in 2018. Over the course of his career, he has honed his skills with the likes of with the likes HKS, SANAA, DP Architects and A_Collective, and worked on projects of various size and scope in Southeast Asia, China and Japan before joining the Russian For Fish team. Outside the office, he can be found kickboxing under the railway arches of Bethnal Green, or wandering the streets of East London, fantasising about pug ownership. A graduate of Università Iuav di Venezia, Italian-born Edoardo first joined Russian For Fish in 2017, as part of an Erasmus-operated internship programme while pursuing his masters’ degree in interior design. He made quite an impact on the team during his time here, and has since become a frequent collaborator, bringing his wide-ranging skills as an architect, graphic designer and art director to numerous Russian for Fish projects. Edoardo divides his time between Russian For Fish’s London HQ and his home in Padova, Italy. Alongside architecture and design, his interests include photography and art.